The Doris Day Animal Foundation is pleased to be hosting our tribute dinner and fundraiser in honor of Doris’ milestone 90th birthday. Many of Doris’ fans and friends will be gathering in Carmel, California, for a full weekend of celebration events. The tribute dinner promises to be a memorable evening of music, gourmet food and wine, a treasure trove of souvenirs and truly one-of-a-kind auction items. 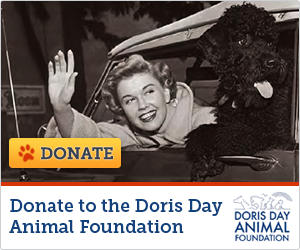 The event will celebrate Doris’ lifelong love of animals and the many accomplishments of the Doris Day Animal Foundation and its grantees. This landmark event will be held at the gracious Quail Lodge in Carmel. These items are open for pre-bidding and will close at the live auction on April 4, 2014. You have until April 1 to place your maximum bid - so you can still be a winner even if you are not in attendance. You are invited to bid on packages ranging from signed collector art to mementos from Doris herself. All items are accompanied by a thank you note, commemorating the birthday weekend, signed by Doris herself. All auction proceeds benefit DDAF, so please bid today to help us continue our critical work! Please email the auction link to your friends, family and neighbors! Anyone who loves celebrity and movie memorabilia won’t want to miss these once-in-a-lifetime packages!